Nowadays, agriculture is constantly evolving and we see that as a normal thing. In this sense, the phytosanitary treatments to prevent or treat diseases is on the agenda of a lot of farmers with very important advances. It is becoming more and more common to spend money on these treatments to have a healthy seed, to do pre-emergency treatments, to prevent diseases or treatments to cure a disease that is developing or is established in our crops. On this occasion we visited a new company (Fuentymaj Garlic S.L.) that has been installed in our village (La Alberca de Záncara - Cuenca) for the treatment of garlic seeds. They are dedicated to thermotherapy whose aim is to eliminate nematodes from the seed for all: purple garlic, white garlic and spring garlic (violet and white). The treatment is very novel and for the last few seasons it has been giving extraordinary results because the garlic is grown very much healthier and the harvest is considerably better because it has less deformation and therefore less destruction. The thermotherapy treatment consists in bathing the garlic in pools with water at 45º together with some chemical products. There is also the possibility of doing this for ecological garlic, replacing chemicals with an ultraviolet light system. The machine used can treat 6 palots/h (about 2,000kg/h). The machine automatically regulates the temperature and extracts the garlic once the treatment is finished. After treatment, the garlic goes to the dryer to return to the same humidity conditions as before treatment. In the dryer are several hours until they are completely dry.... they have two dryers with a total capacity of 500 palots (about 160,000 kg). The price of the treatment is around 0.10 €/kg. The treatment is carried out in summer, since the seed has the optimal conditions to be treated. Once it starts to germinate or humidity conditions vary (in autumn), the treatment can no longer be performed. From here we invite you to visit the facilities so that Augusto, José Carlos or José Andrés can tell you about the benefits of this new system in the elimination of the famous and harmful nematodes. One of the most repeated maintenance tasks in summer is the cleaning of engine air filters of tractors, combines, etc. 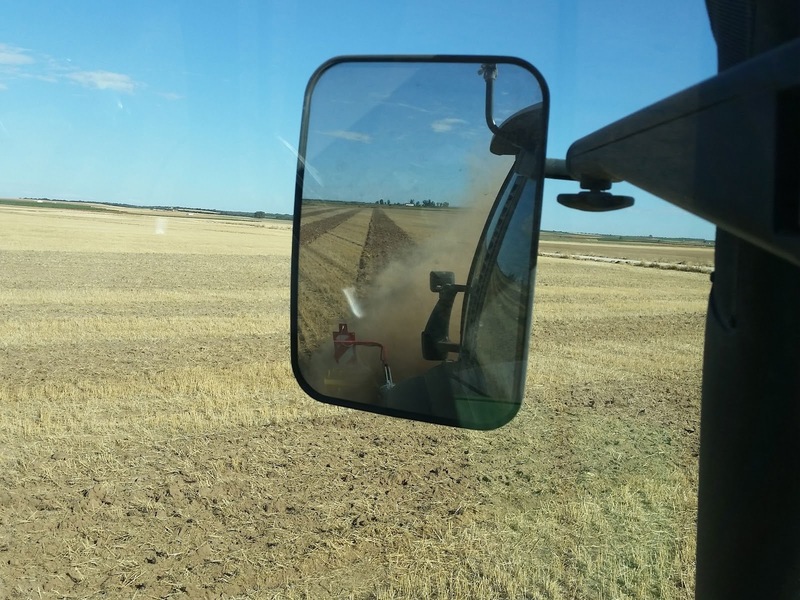 In summer, without any doubt, working on stubble or fallow fields with chissel or disc harrow creates hostile environments, fact that generates a lot of dust as you can see in the photos. From out blog, we invite the manufacturers of tractors and self-propelled machinery to make their tests and trials in our area where they will surely find extreme situations of dust, dryness and heat. These manually tasks take a long time as we need to clean the filter every working day. Even if the tractor is used intensively, it must be cleaned several times a day. In order to improve the technique, we looked for a tool on the Internet that could help us to make this task much easier and, especially, much simpler. It was on the www.armadis.nl website (they are the main distributor for the european market) that we found the Air Filter Blaster. This tool consists in a cleaning cyclone that works with compressed air. The air compressor has to work at a minimum pressure of 6 bar, the recommended preassure is between 8 and 10 bar. Definitely, having a compressor with a large tank helps to obtain a good performance. In our case we use a compressor with a 100 litre tank and the Air Filter Blaster works really fine. The tool consists of a rotor (the main part) that distributes the air inside the filter (cylindrical or cartridge filters). This rotor must be the size of the filters to be cleaned, so there are 3", 4.5", 6" and 9" rotors available (they are interchangeable). As you can see in the video, the task of cleaning the filter is concluded in a few seconds and in a very simple way.